If you haven’t caught Logan yet, do yourself a favor and watch it. I was privileged to get a chance to watch it for the third time in B&W. 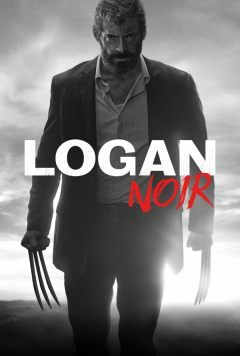 On May 16th, Logan: Noir was put on by Alamo Drafthouse across all of their various theaters for one night only. Following the screening, there was a broadcast Q&A with director, James Mangold, Hugh Jackman, and producer, Hutch Parker. This is the second time Mangold and Jackman have worked together on a Wolverine film and the 8th and final time Jackman has played the titular character over the course of 17 years. In Logan, some time has passed since the glory days of the X-men and we find the Wolverine older, slower, and weather beaten. South of the border, he and the mutant Caliban (Stephen Merchant) have Charles Xavier (Patrick Stewart) locked up in a toppled over water tower. Xavier has some form of dementia and suffers from seizures, which as the most advanced telepathic mutant, is dangerous so they keep him medicated. Xavier is a shell of his former self. Old, decrepit, and soured, the once great teacher is waiting to die. When it seems like all hope is lost and in a world where mutants are nearly extinct, Xavier senses a young mutant. So how did this black and white version come to pass? During production there were many shots that were taken and posted in black and white. Because of the massive response by fans, James Mangold put out Logan: Noir. I definitely took more time to observe the beautifully haunting score, direction choices, and other moments that I didn’t notice while watching it in color. Logan already somewhat has the feel of a western or noir story with an ambiguous protagonist, so it definitely lends itself to b&w. Although it seems like the common assumption or misconception is that audiences won’t have the attention span for something in black and white. We require vibrant colors and quick edits to feed our diminishing brains. I disagree and would love to see more in black and white in the future. It’s a lost art and in this particular film, it really brings out some of the grit without the colorful gore. Logan is more than a comic book movie and its R rating might be attributed to some of that because it takes its time telling the story of an exhausted and somewhat broken man. It’s brutal, yet it doesn’t require any throwaway lines, quips, or comic relief. It doesn’t feel like a big studio flick and to me it is obvious that Hugh Jackman’s swan song as Wolverine and James Mangold’s direction took the character to a completely different level then we’ve seen in any comic book movie to date. The film is now available on digital formats like Amazon/iTunes and will be released in its theatrical version and Noir version on May 23rd on Blu-ray and DVD.